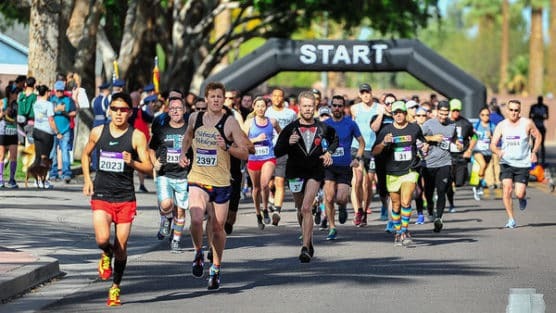 Get ready for a fast, flat run through Arizona’s Valley of the Sun — and celebrate equality, diversity and inclusion — at the Pride Run Phoenix Half Marathon, which also features a 10K and a 5K that follow a fast, flat course through the downtown of the state’s capital and largest city. Fast, flat point-to-point route. 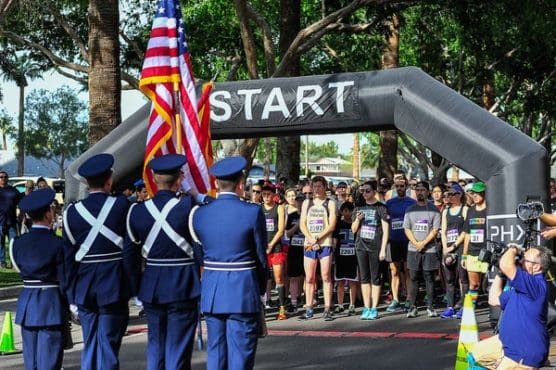 You’ll start the race at Phoenix’s Solano Park, along Montebello Avenue in front of the park and then they’ll head west before turning right on North 19th Avenue. Once you make the turn onto 19th Avenue, you’ll follow it for roughly the next 2 1/2 miles until you turn right again onto Northern Avenue, and then again on Central Avenue. That begins a long, gently downhill straightaway for most of the rest of the race, dropping from just over 1,200 feet above sea level at the highest point in the race — around mile 4 — to just over 1,000 feet by the time you reach the finish line at the Phoenix Art Museum. There’s a quick turnaround on East Van Buren Street, and then runners head back north toward the museum, near the intersection of Central Avenue and McDowell Road. Light rail accessible. 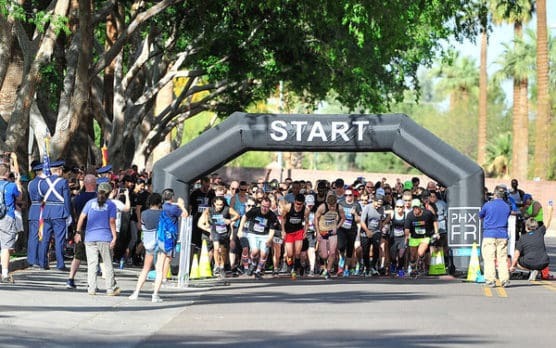 Organizers point out that the race is accessible via Phoenix’s light rail system (known as the Valley Metro Rail), and that you can take the light rail from the finish line back to the starting line area after you complete the half marathon or the 10K. The course also is stroller-friendly and wheelchair-friendly, but unfortunately it’s not pet-friendly — though organizers say your pets are welcome at the start and finish lines, as well as the expo. Nestled in the region known as the Valley of the Sun in central Arizona, Phoenix is known for its warm weather and sun virtually year-round. In March, temperatures are generally mild to moderately warm, averaging between the low 50s and the mid-70s, and just over an inch of rainfall for the month. See the race route map for the Pride Run Phoenix Half Marathon here. 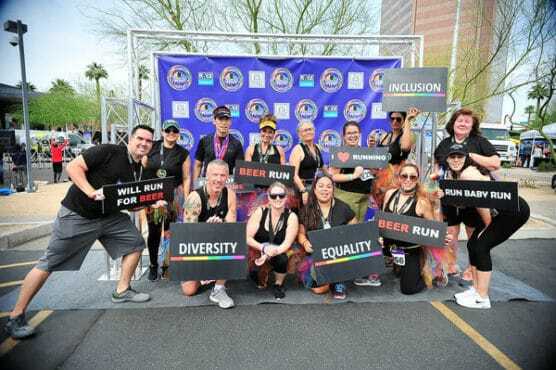 To reserve your spot in the 2019 running of the Pride Run Phoenix Half Marathon, 10K or 5K race, register online at the event website here. 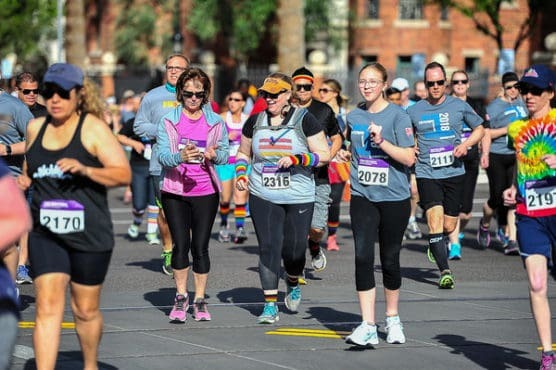 Ever run in the Pride Run Phoenix Half Marathon? Share your impressions here, as well as anything you learned about the race that you think other runners/walkers should know.